I recently picked up an AMT/Ertl '80's Chevy El-Camino SS kit and a Revell Buick Grand National GNX kit in a trade. 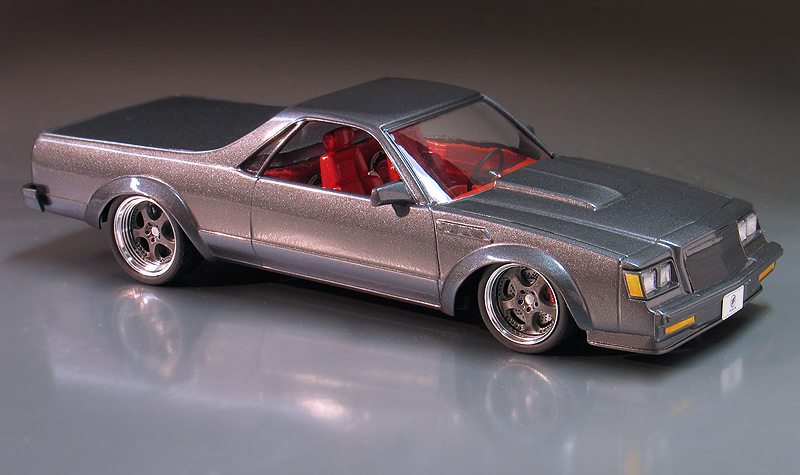 The El-Camino was complete but the GNX was missing a bunch of stuff. Remembering that GM built both the '80's Buick Regals and the Chevy El-Camino from the same G-body platform I had a wild thought. After looking the kits over I started wondering if it was possible to swap the front end from the Buick onto the El-Camino. I tried test fitting the hood and front clip but quickly realized that the Buick was 1/24th scale and the Chevy was 1/25th scale and the Buick parts were too big. Then I remembered that I had an old MPC Buick Regal Southern Stocker kit in my stash. 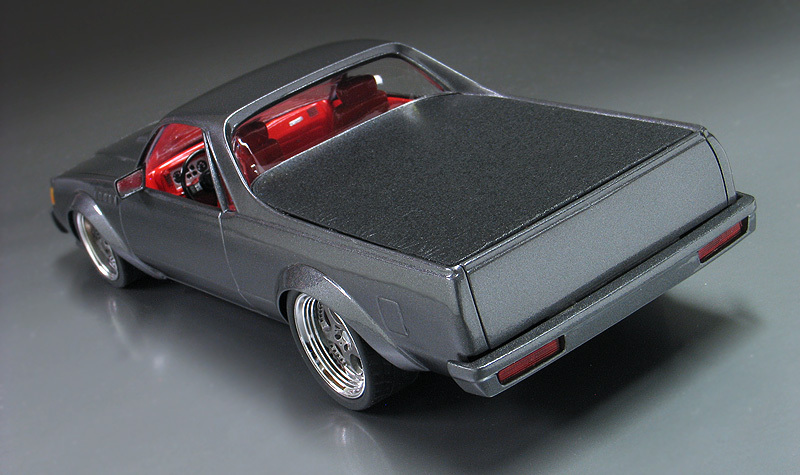 I tried fitting the hood from smaller 1/25th scale MPC Buick to the El-Camino and to my surprise it was a drop-in fit. Thus, the idea for this Buick "Grand-Camino" mashup was born. The front facia swap was pretty straight forward. It was already the right width and just need a little bit of bondo to get the facia to match up to the fenders. I didn't like the look of the El-Camino fender wells with the Buick front end so I added the fender flares from the Revell GNX kit. I think it helps the pickup look more like a Buick and allowed me to also run a bigger set of wheels. 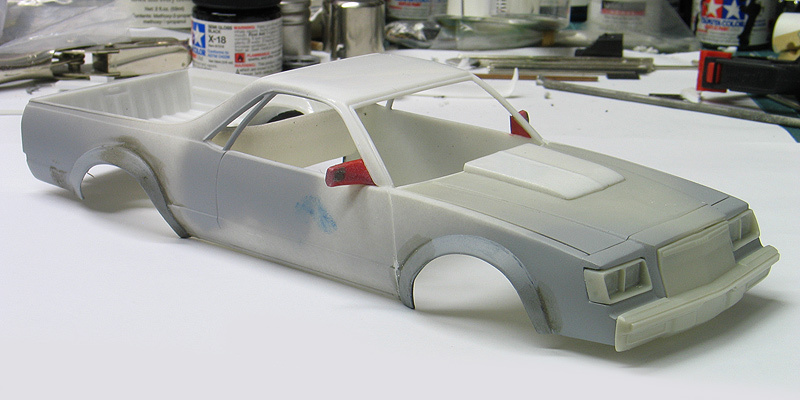 To complete the body mods, I added the fender vents from the GNX, the hood scoop from the El-Camino SS and a set of side mirrors from a Tamiya '80's Toyota Supra. Other custom body tricks include removal of all the trim, door handles and I filled in the license plate recess on the tailgate. I scratchbuilt the front airdam from sheet stryene. The El-Camino's rear bumper was smoothed too. Lastly, I also used the tonneau cover from the El-Camino kit, but modified it so that it would fit flush down inside the bed. The paint is Testor's One-Coat Graphite Dust lacquer followed by a PPG urethane clear coat. 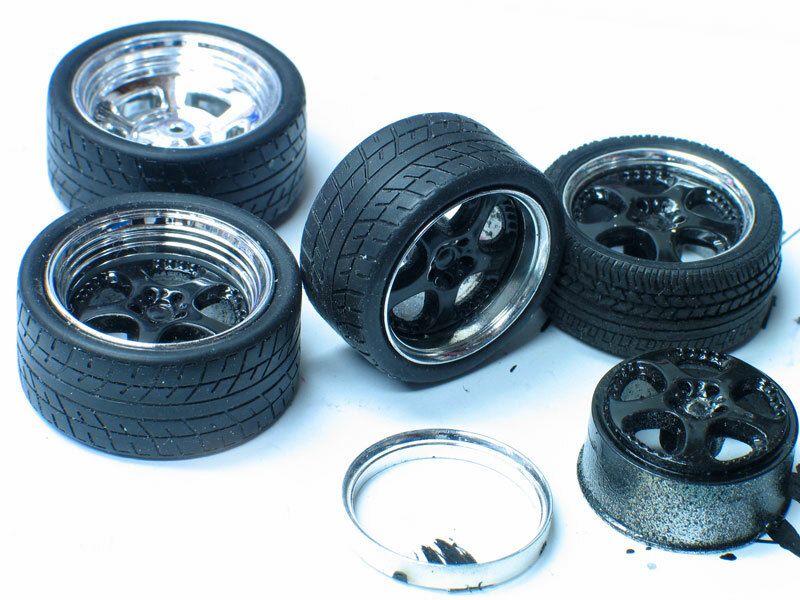 The wheels I used were custom made using the centers from a set of 18" Aoshima S-Parts wheels. For the front I used two sets of the Aoshima rims and glued them back to back so I could make a wider wheel on the front. The back wheels use the Aoshimas center mated to a 20" Pegasus Hobbies Hella rim with the center cut out. While the centers were out I painted them to match the body color. The tires are matching 18"s and 20"s from Pegasus. The brakes are my own resin cast copies of a Tamiya part. Inside the Interior I made a custom speaker box from sheet stryene to sit behind the seats. The sub-woofer components are my own resin cast pieces copied from various kits. I also dug through my parts box and found a set of sport bucket seats from an '83 MPC Chevy Cavalier kit. The shifter came from my parts box. I used the dash from the El-camino but swapped in the steering column and wheel from the Revell GNX. Lastly, I also added red flocking for the carpet.